We wonder if nanocellulose could be used to make bendy spoons too? Up until recently, graphene was heralded as the wonderstuff to end all wonderstuff, but there's a new super-material in town, and its name is nanocellulose. From bendable batteries and flexible screens to superhero-like body armour, nanocellulose could revolutionise our lives. Nanocellulose is a nanoscale configuration of good old cellulose, which is one of the most abundant materials on the planet. It's the main constituent of plant cell walls, providing structural support to pretty much every green thing on Earth. From tree bark to flower stems, it's the material that combined with water produces the effect known as turgor, providing their rigidity and supporting plants like the bones of mammals. Cellulose itself is simply a combination of glucose molecules, linked in long chains in a particular configuration, differentiating it from starch and other glucose-derived substances. In its natural state, within plants and other living things, it's useful for materials like paper. As a foodstuff we call it fibre, which you can't digest without help, although cows, sheep and horses can, which is why they graze on grass. However, when you shrink the structure of cellulose down to the nanoscale and apply a particular configuration to it, things start to get interesting. You see, a bit like other crystalline constructions, such as incredibly hard diamonds made from a pure carbon crystalline lattice, the structure lends drastically different properties to otherwise unremarkable materials. By forming cellulose into long polymers or meshing it into a crystalline lattice, nanocellulose (or nanocrystalline cellulose, to give it its full name) becomes one of the strongest materials known to man. It can also conduct electricity and is extremely light, which are properties that make it a super-material with immense potential to change our world. The beauty of nanocellulose, before we get on to what we can do with it, is how we can produce it. Up until recently, nanocellulose was produced by treating wood pulp; an expensive and costly process in large quantities. Now a new technique that relies on algae can produce nanocellulose simply from sunlight and carbon dioxide. The genetically modified blue-green algae produce nanocellulose as part of its energy metabolism, which helpfully also takes in carbon dioxide during the photosynthetic stage. So, not only is producing nanocellulose incredibly cheap and energy efficient, powered only by the sun, but it can also take carbon dioxide out of the air. 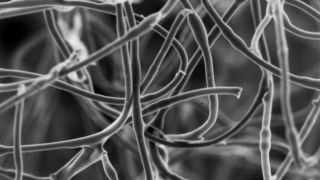 Now that we're finally on the verge of being able to produce nanocellulose efficiently, cost-effectively, and in useful quantities, it's time to start thinking about what we can actually do with something so strong and light. The idea of using a flexible display in phones and other portable devices has been banded around for ages now. Unfortunately, one of the leaders in the field, Samsung Display, has hit a few snags of late, which means we've still got a little way to go before we see devices we can actually buy. Because nanocellulose is both light and strong, and most importantly, transparent, it could make the ideal material to replace glass or plastic in display screens. The nanocellulose could be made into a flexible but strong and durable coating for the bendable displays, enabling all sorts of fancy formats and screens. That's why Pioneer Electronics is actually looking into it as we speak, crafting some of the thinnest and most flexible displays ever made. It's biodegradable too, which means once you've upgraded your flexible phone, at least one part of it can be recycled. It's all very well having bendable screens, but the other components of our phones, tablets and laptops aren't flexible in the slightest. Nanocellulose could help here too.